Black Friday is lame and over-hyped. Cyber Monday is overwhelming. But the day after Christmas? Well, it may be the holiday shopping day you've been sleeping on over the years. 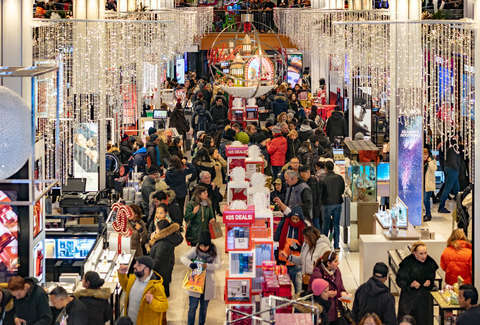 Many major retailers return to regular business hours on December 26 and launch Day After Christmas sales to compete for your fresh gift card balances and that $50 bill your grandma tucked into one of those Christmas cards that are glorified cash withdrawal envelopes. There are tons of deals to be had. The iconic department store is rolling out a slew of sales for the day after Christmas. Here's what to expect, according to a spokesperson: 25% off select dresses, 50% off designer suit separates, 25-45% off select fine jewelry, 25% off select party accessories, 60% off select women’s sweaters, 50-60% off coats for the whole family, 50% off down-alternative pillows, 70% off select designer bedding, and 50-75% off select boots. If you were lucky enough to get an Amazon gift card in your stocking this year (or even if you didn’t), the mega e-tailer has a whole slew of end-of-year deals to tempt you. Head to Amazon.com and scope out their “Deals of the Day” section to see just what’s up for grabs. You can get select New York Times best sellers for up to 80% off via Amazon's Kindle book store on December 26 only. Discounted titles include The Goldfinch ($6.99), Code Girls: The Untold Story of the American Women Code Breakers of World War II ($2.99), and Dopesick: Dealers, Doctors, and the Drug Company that Addicted America ($6.99), among many others. As in years past, the beloved department store will be kicking off its Half-Yearly Sale on December 26, with great deals on clothing, shoes, accessories and more for men, women and children. The sale will last through January 2, 2019. Stock up on some sudsy #selfcare goods with B&BW’s Semi Annual Sale, which kicks off December 26 and offers up to 75% off select items including Wallflowers, hand soaps, aromatherapy, body care, and fragrance favorites. If you feel like shopping from the comfort of your sofa, you get 35% off tons of gear from the jean maker when you spend $150 and use code VISA25. The minimalist clothing brand slashed prices on more than 200 items for its end-of-the-year clearance sale, starting December 26. And for 24 hours only, you can get men's or women's ultra warm down outerwear for $99.90. All orders get free shipping, too. Head to your nearest outpost of the build-it-yourself furniture purveyor and you'll find all sorts of items discount by up to 50%, and probably a whole bunch of other stuff you want but don't actually need. The sale lasts through January 6, 2019, but it's only good in store (and not online). On the bright side, at least that means you can get some super-cheap hot dogs and Swedish meatballs while you're there. This year, Kohl's is throwing an after Christmas "Stock Up" sale with up to 70% off clearance both online and in-store. Deals span several store departments, including bed and bath, shoes, clothing, and kitchen and dining. The sale ends December 31. The home goods and furniture store's Winter Clearance is here with up to 70% off on select items from holiday categories to everyday products -- you know, furniture, decor, and outdoor. The ever-popular big box store with the bullseye is coming in hot with an extensive post-Christmas sale, offering up to 25% off storage and organization items, plus up to 50% off pretty much everything already on clearance. Get in on the post-Christmas deal action by saving up to 70% off JCPenney exclusive brands across nearly all departments in the store’s “Big Winter Wrap-Up” sale. Also, you can score an extra 25% off purchases of $100 or more when you use code SALE4 at checkout. The iconic clothing and outdoor gear retailer is slashing prices on items already on sale in every department. Specifically, you can snag an extra 25% off when you use code EXTRA25 at checkout. If the madness of holiday meal-prep has you in the mood to cook more (or at least upgrade your kitchen a bit), Williams Sonoma has a ton of great deals. Right now, it’s offering up to 75% off select cookware, dinnerware, linens, electric items, and more. The popular home goods and furniture e-tailer has a bunch of bargains up for grabs right now, and is offering up to 75% off clearance items, 70% off holiday decor, and more if your preferred form of shopping is the kind you can do from your couch. Didn't get the face lotion you wanted for Christmas? Hoping to actually moisturize and exfoliate like an adult in the new year? Well, Kiehl's is running a new promotion through the end of the year with $20 off orders of $65 or more. Just use the code "JINGLE" at checkout or ask about the discount in-store. The clothing retailer's "Main Event" is back with an extra 50% off final sale styles in-store and online. For the latter, use the code "BIGGERSALE" at checkout. Or you can turn to J. Crew Factory Outlet for even more deals. Specifically, it's offering these three online-only sales: 40% off new arrivals, up to 60% off everything else, and up to 50% off clearance with the code "YAYSALE". The retailer's semi-annual "CLEARANCE EVENT" (yes, in ALL CAPS!) is back. Get up to 50% off on holiday decor, table linens, gift wrap, and more festive stuff that you won't need for almost an entire year from now. The company has a bunch of discounts on offer: up to 50% off holiday decor, up to 30% select appliances, and up to 25% off on storage solutions, among other deals. And for December 26 only, you can get 35% off smart locks when you order online. If all of this Day After Christmas shopping is making your hungry, Shake Shack just launched a deal for buy-one-get-one free (BOGO) cheeseburgers. It's good through January 2, 2019.